Hemp products on display at The Hempest in Cambridge. The first medical marijuana dispensary ever to hit Harvard Square has officially opened its doors. Healthy Pharms Inc., a registered nonprofit medical marijuana dispensary, opened for business within The Red House restaurant at 98 Winthrop St. Saturday. The shop will be open daily from noon to 6 p.m. 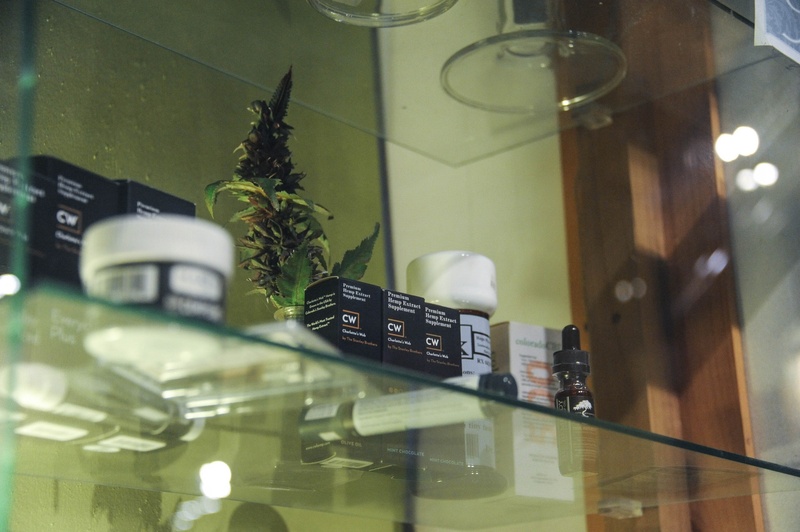 The Cambridge location marks the second dispensary run by Healthy Pharms, a Georgetown, Mass.-based business that cultivates and processes its own marijuana. The opening of the Harvard Square joint follows months of controversy. Some Cambridge residents and store owners previously alleged Healthy Pharms would likely have a negative effect on the area. One Square businessman—Raj K. Dhanda, the owner of Crimson Galeria—even sued to block the medical marijuana dispensary. Dhanda filed a complaint in federal court against Healthy Pharms in early September, claiming at the time that his businesses have been “substantially injured by a conspiracy to sell marijuana.” The lawsuit is ongoing. Dhanda declined to comment on the opening of the dispensary. In a phone call Saturday morning, Dhanda said he had nothing to say. In February, the Cambridge City Council modified the zoning regulations for medical marijuana dispensaries to permit up to "five or six" new dispensaries in the city, as long as each dispensary complies with state and local law. The regulations do not mention federal law. Healthy Pharms ultimately secured all the required approvals, according to Paul W. Overgaag, the chief financial officer of Healthy Pharms. Overgaag said he was “totally excited” for the store’s opening. Though Overgaag said Healthy Pharms plans to keep its Cambridge location open for years to come, he said he recognized that, due to the controversial nature of marijuana, potential problems could light up in future. Overgaag declined to comment on whether the dispensary may pursue a recreational license going forward. The Massachusetts Legislature gave recreational marijuana shops the green light to begin operating in the state over the summer, but the Cambridge city government is still hashing out the details of how this would work. The body could begin approving recreational licenses in spring 2018. Overgaag already owns two other properties in the Square: the eatery and bar Charlie’s Kitchen, at 10 Eliot St., and The Red House, the restaurant that now shares its Winthrop St. digs with the dispensary. Denise A. Jillson, executive director of the Harvard Square Business Association, noted Overgaag has been a property and business owner in the Square for a long time and said she thinks he is “highly respected” in the area. Jillson said that, when the Business Association board voted on whether or not to support the dispensary, 22 out of 23 board members voted to endorse the concept. Jillson added she thinks Healthy Pharms will have a positive impact on Harvard Square business. “We expect that as with all good business, whether retail, restaurant, or medical marijuana dispensary, that giving people options, a variety of options, giving them good reasons to come to the Square, it’s always helpful,” she said. Nonetheless, just a few hundred yards from Harvard Yard, Healthy Pharms is growing—and looking to make green.